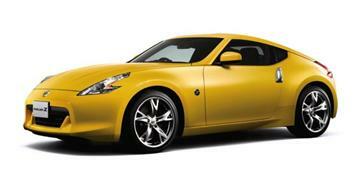 Nissan Motor Co., Ltd. released the all new, fully redesigned Fairlady Z sports car last month in Japan. In the nearly 40 years since the first-generation S30 model debuted in 1969, the Fairlady Z has earned a reputation as one of the most desirable sports cars in the world, with approximately 1.7 million units in global sales to date. The latest Fairlady Z, while embodying the first generation's signature "Z-ness" in terms of high performance, design and high value, incorporates dramatic advances in dynamic performance and perceived quality. The Z also offers a strong feeling of "newness," as expressed by its fresh exterior and interior styling and new performance features. The new Fairlady Z's enhanced performance characteristics are a result of its shorter wheelbase, reduced weight and the adoption of the larger, more powerful VQ37VHR 3.7-litre V6 engine. It also offers the world's first 6-speed manual transmission with synchronised rev control or a newly developed 7-speed automatic transmission with a manual shift mode. The combination of more horsepower, new transmissions and a refined suspension helps the Fairlady Z deliver the superior acceleration, cornering and stopping capabilities expected of a true world-class sports car. The Fairlady Z's unmistakable front-engine, rear-drive body proportions only hint at the overwhelming performance inherent under its beautifully sculpted skin. Further notice of the exhilarating driving experience that awaits is given by its iconic "Z-ness" - from the dynamic character line that runs from the headlights to the rear, delineating the waistline and cabin arch to the flared rear guards that strongly accentuate the drive wheels. The wheelbase of the new Fairlady Z has been shortened by 100 millimetres from that of the previous model, offering not only crisper handling and dynamic performance but also a more aggressive sport stance. The new Fairlady Z weighs approximately the same as the previous model, despite its enhanced equipment features and the body rigidity measures that have been adopted to improve safety performance. Significant weight savings were achieved by using aluminium for the bonnet, door panels and hatchback and by optimising various body structures. The Fairlady Z comes in a choice of eight attractive body colours, including three all-new Nissan colours: Premium Ultimate Yellow and two three Pearl-Coat (3P) colours - Premium LeMans Blue and Brilliant White Pearl. All exterior colours are standard with Nissan's Scratch Shield, which self-repairs minor scratch marks in the paint surface. The new Z's cockpit design pursues a sense of solid security and a feeling of unity with the driver. For example, a wire frame was added to the shoulder portions of the driver's seat for better support. The cushion and main section of the seatback are covered with a slide-resistant suede material. A low driver's seat hip point keeps the body from shifting laterally, providing support for withstanding powerful cornering forces. These features, along with a lumbar support, enable the driver to maintain a proper driving posture at all times. The interior features a new suede cloth, Forte Suede, which can be attached to three-dimensional panel surfaces (something that was not possible with the types of trim cloth used previously). This high quality, dense suede cloth has a pleasing tactile feel and imparts a soft, embracing sensation to the cockpit area. The lid of the centre stack storage bin is covered with Sofilez, a new, soft-touch synthetic leather that is embellished with double stitching. Meticulous attention was also paid to the material, firmness and finish of the driver's kneepad, providing comfortable support for the inside knee. The centre armrest is thoughtfully rounded to avoid interfering with the driver's shifting action. A choice of three interior colours is offered: Persimmon Orange, which expresses an emotional mood; Black that provides a calm, composed ambience; and Grey, which gives the interior a bright, cool and modern look. The new Fairlady Z is powered by the VQ37VHR engine with Nissan's Variable Valve Event and Lift (VVEL) system. It generates maximum power of 247 kW (336 PS) at 7,000 rpm and maximum torque of 365 Nm (37.2 kgfm) at 5,200 rpm. Combining power with ease of driving, this remarkable engine accelerates effortlessly and smoothly all the way to the high-speed range. The Fairlady Z comes with the world's first 6-speed manual transmission with synchronised rev control that regulates the engine speed to the optimum level, matching the driver's shifting action when changing gears. Also offered is a 7-speed automatic transmission with a manual shift mode that lets drivers enjoy the direct shifting sensation of a manual gearbox along with world-class shift response. Aluminium-calliper opposed-piston Akebono brakes are fitted at all four wheels for driving ease in urban areas and in congested traffic, together with stable braking performance on winding roads and in high-speed cruising. Sales target for the domestic Japanese market is 500 units per month. 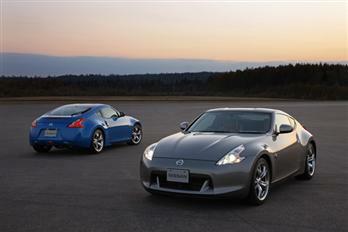 Nissan will release the Fairlady Z in Australia, as the 370Z, later this year.